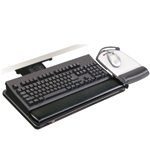 Easily adjust your keyboard tray for height and tilt, then separately adjust your mouse platform, if you'd like, with this highly versatile system. Compatible with ergonomic keyboards. For corner and straight-on workstations that can accept a 21.75" track. * Simply flip the lever to adjust height, flip lever back to lock in place. Pull the tab to adjust tilt. * Gel wrist rests for keyboard and mouse platforms add comfort by minimizing pressure points. Leatherette cover lasts longer than fabric-covered wrists rests and is easier to clean. * Super adjustable separate mousing platform mounts left or right and needs no tools to adjust. Platform slides left and right over the keyboard, tilts forward and backward and adjusts up and down to the same level as the keyboard platform. Features 3M™ Precise™ Optical Mousing Surface.